Distributed source coding is one of the key enablers for efficient cooperative communication. The potential applications range from wireless sensor networks, ad-hoc networks, and surveillance networks, to robust low-complexity video coding, stereo/Multiview video coding, HDTV, hyper-spectral and multispectral imaging, and biometrics. The book is divided into three sections: theory, algorithms, and applications. Part one covers the background of information theory with an emphasis on DSC; part two discusses designs of algorithmic solutions for DSC problems, covering the three most important DSC problems: Slepian-Wolf, Wyner-Ziv, and MT source coding; and part three is dedicated to a variety of potential DSC applications. Clear explanation of distributed source coding theory and algorithms including both lossless and lossy designs. Rich applications of distributed source coding, which covers multimedia communication and data security applications. Self-contained content for beginners from basic information theory to practical code implementation. 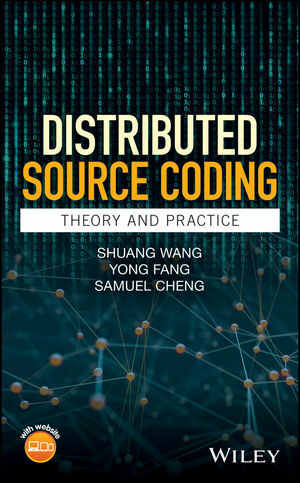 The book provides fundamental knowledge for engineers and computer scientists to access the topic of distributed source coding. It is also suitable for senior undergraduate and first year graduate students in electrical engineering; computer engineering; signal processing; image/video processing; and information theory and communications.